Hello, forex friends! Another NFP report is coming our way this Friday at 12:30 pm GMT. There’s therefore a good chance that the Greenback may get a volatility injection. The upcoming NFP report also happens to be the last NFP report before the June 13 FOMC statement. It’s therefore likely that traders will be using the NFP report to gauge the possibility of a June rate hike. And if you need to get up to speed on what happened last time and what we can expect for this time around, then today’s Event Preview is just for you. I noted in my Event Preview for the April NFP report that leading indicators were pointing to a slowdown in jobs growth, which went against the consensus that jobs growth accelerated. However, historical tendencies leaned more towards the consensus and even tilted probability more towards an upside surprise. Also, historical tendencies showed that wage growth usually slow between March and April, which increases the chance that wage growth will print a downside surprise. And, well, the leading indicators were apparently right since the April NFP report revealed that the U.S. economy only generated 164K non-farm jobs, which is less than the +190K expected. However, wage growth did surprise to the downside since average hourly earnings only rose by 0.1% (0.2% expected). Moreover, the previous reading for wage growth was downgraded from +0.3% to +0.2%. But on a more upbeat note, non-farm payrolls in March was upgraded from +103K to +135K. This was partially offset by the slight downgrade for the February reading (from +326K to +324K). Still, that’s a net increase of 30K, which is good. Also, the jobless rate dropped from 4.1% to 3.9%, which is the best reading since December 2000. Admittedly, however, the jobless rate improved partially because the labor force participation rate deteriorated from 62.9% to 62.8% as 236K Americans left the labor force. 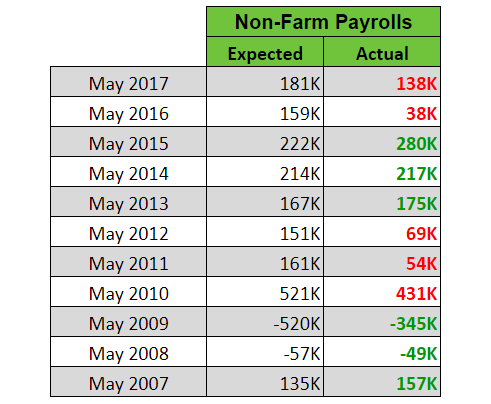 Overall, the April NFP report was mixed but was more negative than positive since both wage growth and jobs growth failed to meet expectations. And that’s why the initial reaction to the NFP report was to kick the Greenback lower. However, the poor NFP report was not enough to derail expectations for a June rate hike, some market analysts say. And they pointed to the rise in U.S. bond yields in the wake of the NFP report as a sign of this. And that’s very likely why the Greenback quickly bounced back after the initial drop. For the employment situation during the month of May, the general consensus is that 190K non-farm jobs were generated, which is more than the +164K back in April. Most economists therefore think that jobs growth accelerated. Despite the expected pickup in jobs growth, the jobless rate is expected to hold steady at 3.9%. Wage growth, meanwhile, is also expected to pick up by printing a 0.2% increase, which is a tick higher compared to the +0.1% recorded in April. Markit’s manufacturing PMI report noted that “payroll numbers increased to a greater extent than in the previous month.” And while input costs rose, that was due to “Robust demand for raw materials and rising commodity prices,” rather than higher wages. ISM’s manufacturing PMI report will be released after the NFP report while ISM’s non-manufacturing PMI report won’t be released until next week. We’re therefore kinda handicapped on this one. With that said, Markit’s PMI reports point to stronger jobs growth in both the manufacturing and services sector, which supports the consensus that jobs growth accelerated. Well, comparing the rate of job creation in April and May doesn’t really show any historical tendencies. Although there are more instances when jobs growth in May was stronger, which somewhat supports the consensus. As to how economists fared with their guesstimates, well, there are also slightly more upside surprises. It’s worth pointing out that economists were too optimistic with their guesstimates during the past two years, though, resulting in downside surprises. And it may just be a coincidence, but there’s a three-year pattern of upside surprises, followed by downside surprises, followed by another set of upside surprises. And this year might complete the set of downside surprises. It remains to be seen if this pattern will hold, though. It’s also worth pointing out that the previous reading usually gets downgraded. As for wage growth, the consensus that wage growth accelerated does seem to have historical basis. However, economists don’t really have any historical tendencies that we can exploit since their guesstimates are all over the place. To summarize, we don’t have the PMI reports from ISM but the available leading labor indicators seem to be pointing to a pickup in jobs growth, which is in-line with consensus. Historical tendencies also appear to support the consensus, which skews probability slightly more towards an upside surprise. However, there seems to be a three-year pattern of alternating upside and downside surprises. And this year might complete the latest set of downside surprises. It could just be a quirky coincidence, though. As for wage growth, historical trends show that there are more instances when wage growth was faster in May compared to April, which is in-line with consensus. However, that doesn’t automatically translate to more upside surprises since economists have had a mixed record when it comes to their guesstimates. Anyhow, just be reminded that we’re playing with probabilities here, so there’s always a chance that non-farm payrolls may print a downside surprise. Also, keep in mind that traders usually (but not always) have their sights on non-farm employment. If non-farm employment beats expectations, then the Greenback usually jumps. On the flip side, if non-farm employment fails to meet expectations, then the Greenback usually get kicked lower. And the Greenback’s initial reaction to the April NFP report is a classic example of the latter. For follow-through buying or selling, that usually depends on the other details of the NFP report, with wage growth usually in focus because of its more direct link to inflation. Although that wasn’t the case during the previous NFP report. Also, do note that even if non-farm payrolls fail to meet expectations, follow-through selling is usually limited as long as at least 100K jobs are generated since 100K is the magic number of jobs per month that’s needed to keep up with working-age population growth. In other words, rate hike odds likely won’t deteriorate too much as long as the actual reading for non-farm payrolls is above 100K. Okay, that’s all I’ve got. By the way, if news trading ain’t your thing or if high volatility makes you uncomfortable, then remember that you always have the option to sit on the sidelines and wait for things to settle down.